I love cooking. I love finding and following new recipes, but most of all, I love inventing new recipes and creating delicious dishes. 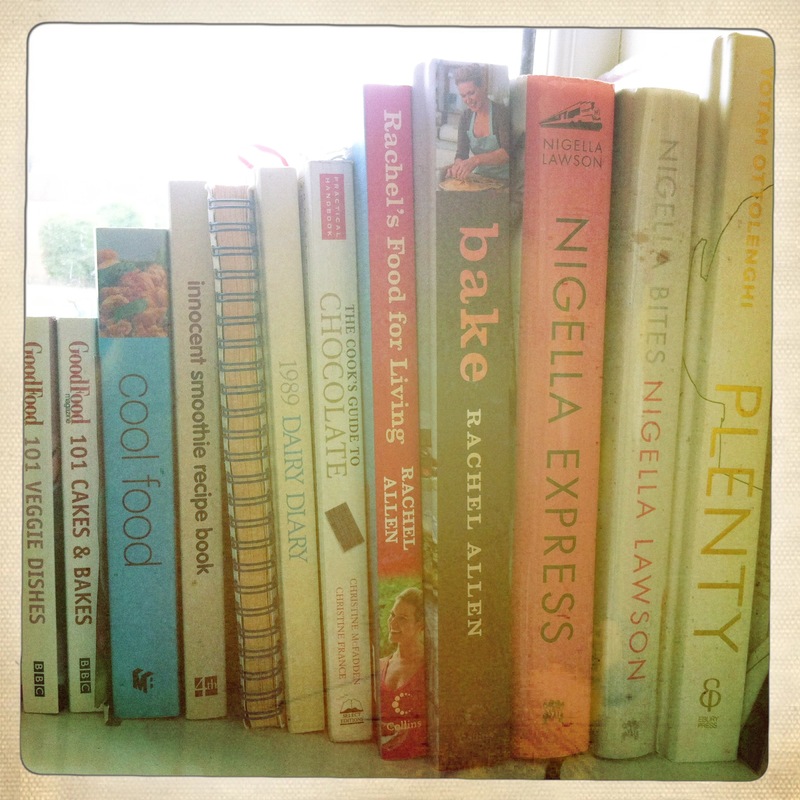 Here, I’ll share a range of recipes each week – some old classics and some new ideas, which I hope you will enjoy. This simple supper makes the most of the delicious flavours of sage and mushrooms and is really quick to make. 1. Bring a pan of salted water to the boil and cook the gnocchi according to packet instructions (usually only 2-3 mins). 2. 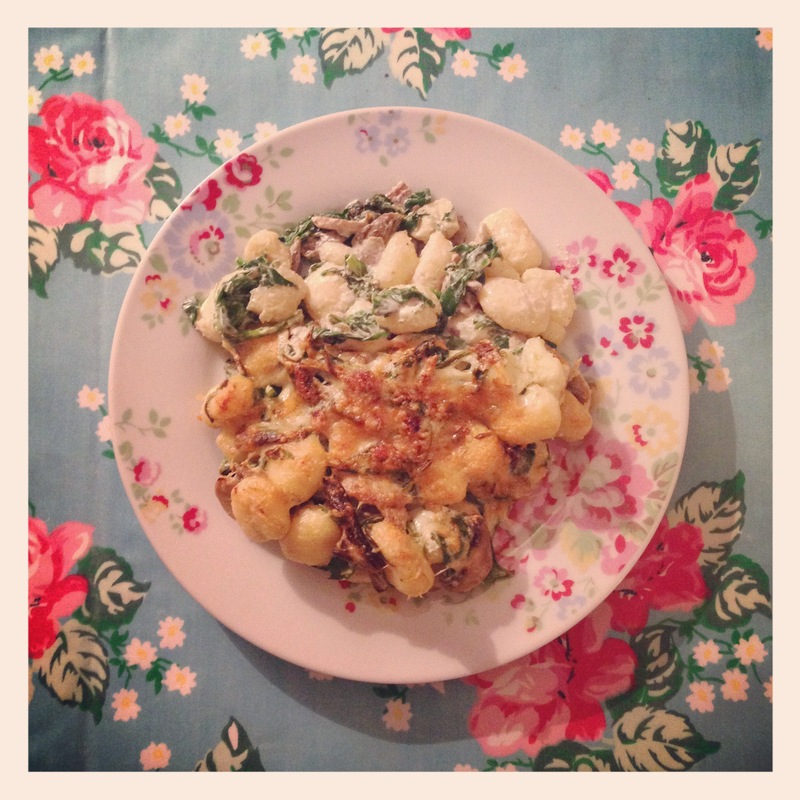 Whilst the gnocchi is cooking, heat the olive oil in a frying pan and fry the mushrooms until beginning to brown. 3. Add the chopped spinach, cream cheese, sage leaves and salt and pepper and stir. 4. Drain the gnocchi and add to the frying pan. Stir through to coat and transfer to an ovenproof dish. 5. Top with grated cheese and grill for 8-10 mins, until the cheese is beginning to bubble and turn brown. This spicy Middle-Eastern dish is really delicious and makes the perfect one-pan supper or tasty brunch. 1. Dry fry the cumin seeds in a large frying pan for 1-2 mins. 2. Add the oil, onions and peppers and fry for 5 mins until beginning to soften. Add the sugar and dried herbs and continue cooking for 5 mins. 3. Add the tomatoes, mushrooms, coriander paste, tomato puree and chili flakes and continue to cook for 10 mins, adding the water a spoonful at a time, to form a thick sauce. 4. Reduce the heat and make two wells in the tomato and pepper mix. Crack an egg into each space and cover the pan. Cook on a low heat for 10-12 mins until the eggs are just set. 5. Serve in the pan, with plenty of crusty bread to soak up all the juices. These light pancakes with mushrooms and asparagus make a deliciously simple Spring supper! 1. Sift the flour into a large bowl and make a well in the centre. Add the egg and pour in quarter of the milk. Whisk to combine and then add the remaining milk, a quarter at a time until fully combined. Add the chives, salt and pepper and leave to rest for 20 mins. 2. Whilst the batter rests, quickly fry the mushrooms and asparagus in the olive oil, until beginning to brown. 3. Remove from the heat and stir in the cream cheese and Emmental until melted. Set to one side. 4. Heat a small amount of oil in a frying-pan and pour about two tablespoons of batter into the pan. Swirl around to coat the bottom of the pan. Cook for a few mins, until the bottom of the pancake is golden brown, then flip over and cook for another few minutes until golden brown. Repeat until you have used all the mixture (you should get about 6 pancakes). 5. Divide the mushroom and asparagus mixture between the pancakes. Spoon a line of the filling in the centre of a pancake and then roll up. 6. 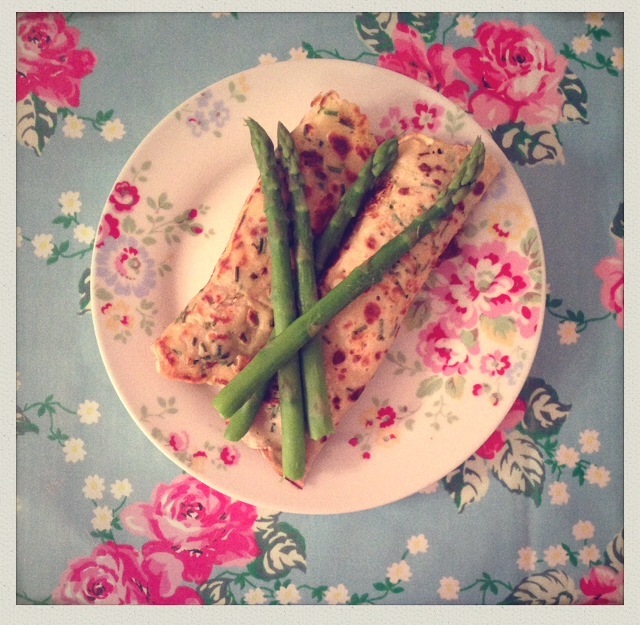 Serve with steamed or boiled asparagus. 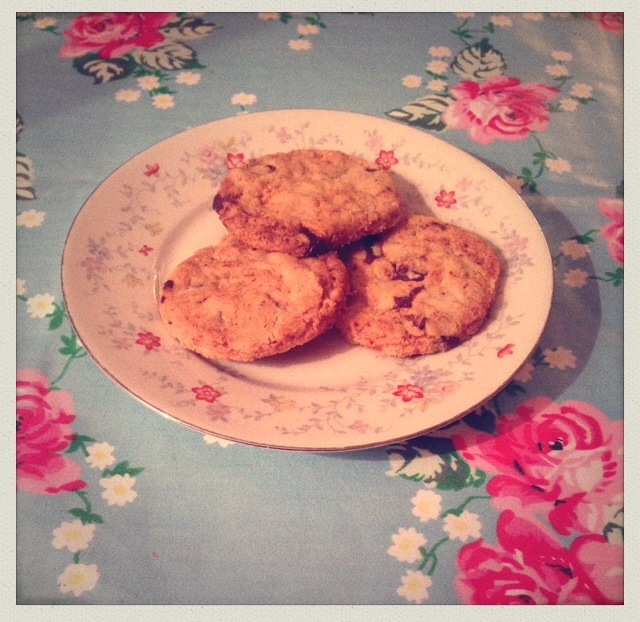 These deliciously moreish chocolatey bites were the happy result of a raid of the cupboards! Feel free to substitute the ingredients for what you have in. 1. 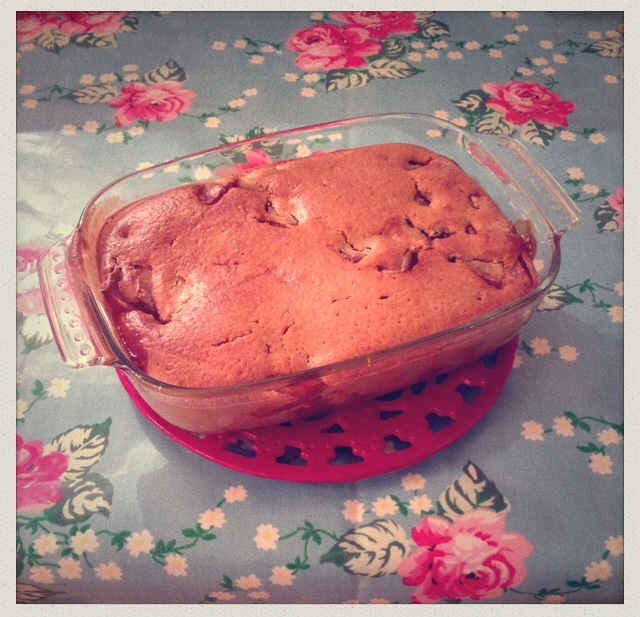 Line a 20cm square baking tin with greaseproof paper. 2. Melt the chocolate and butter together in a glass bowl over a pan of gently simmering water. 3. Allow to cool slightly and then stir in the remaining ingredients. 4. Tip into the prepared tin, cover with tin foil and pop in the fridge for 1-2 hours before cutting into squares and enjoying! 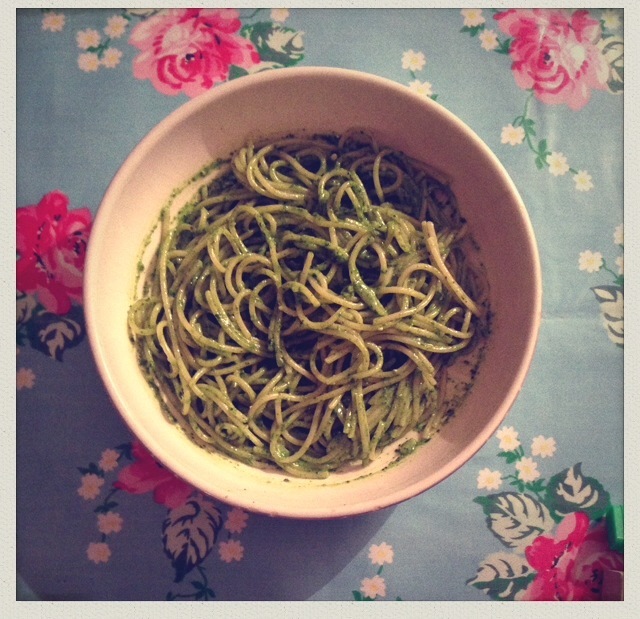 I absolutely love pesto, even more so when it is homemade. This recipe is so simple to make, it’s surprising how something so tasty can be whipped up so quickly! 1. Cook the spaghetti according to packet instructions (usually 8-10 mins in salted, boiling water). 3. Drain the pasta and return to the pan. Stir through the pesto to coat. 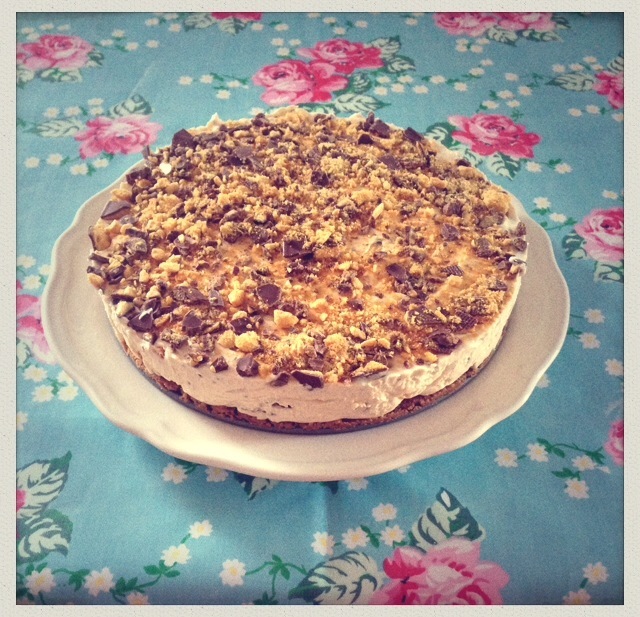 This delicious, American inspired dessert is the perfect Winter warmer! 1. Preheat the oven to 160 ˚C. 2. Put the apples, sugar, apple juice, maple syrup, cloves and vanilla essence in a saucepan and heat gently, until the sugar dissolves. Then allow to simmer for 10 mins, until the apples begin to collapse. 3. Whilst the apples are cooking, sift the flour into a bowl with the cinnamon and rub in the butter with your fingertips. Stir in the sugar, then add the egg and milk and mix together to form a soft batter. 4. Drop tablespoons of batter over the fruit, then bake for 25-30 mins, until the topping has a golden crust. 5. Serve with single cream and maple syrup. 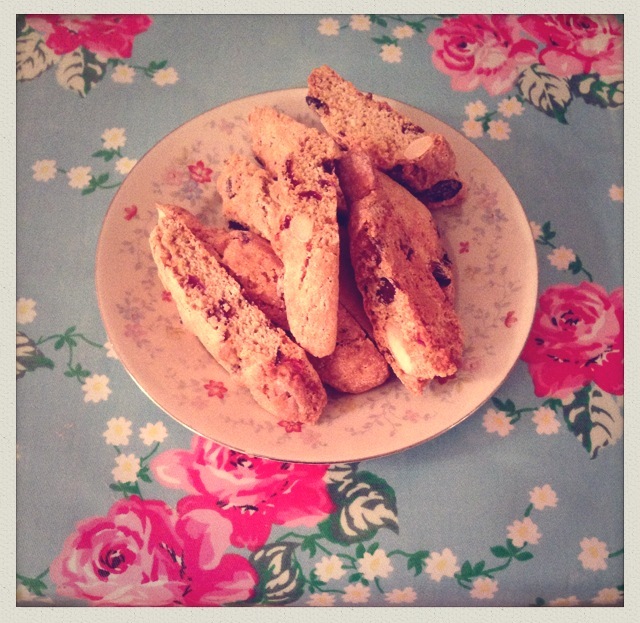 I absolutely love biscotti! These delicious, crunchy, spiced biscuits are perfect with a cup of coffee to round off a delicious Christmas meal and are so simple to bake! 1. Heat oven to 160˚C and line 2 baking sheets with baking parchment. 2. Put the flour, baking powder, spices and sugar into a large bowl and stir in the eggs and zest until the mixture is beginning to stick together. 3. Use your hands to bring the dough together – this will take a few minutes. 4. Add the fruit and nuts and work in to the dough. 5. Turn the dough out onto a lightly floured surface and divide into 4. Make each quarter into a sausage, about 30cm long. 6. Bake for 25-30 mins, until the dough has risen and feels firm, but is still pale. 7. Remove from the oven and allow to cool slightly, before cutting into diagonal slices about 1cm thick. 8. Lay the slices flat on the baking paper and bake for another 15 mins. Turn over and bake for a further 15 mins. I make a lot of soup, but this has definitely become a favourite. Rich mushrooms and creamy chestnuts combine to form a deliciously rich and smooth wintery soup. Perfect for a vegetarian Christmas dish. 1. Heat the olive oil in a large saucepan and gently fry the onion for 5 mins until beginning to soften. 2. Add the garlic, chopped mushrooms, Porchini mushrooms, chestnuts and rosemary and stir to coat. 3. Use the liquid from the Porchini mushrooms to make up to ½ litre vegetable stock and add to the pan with the soy sauce, salt and pepper. 4. 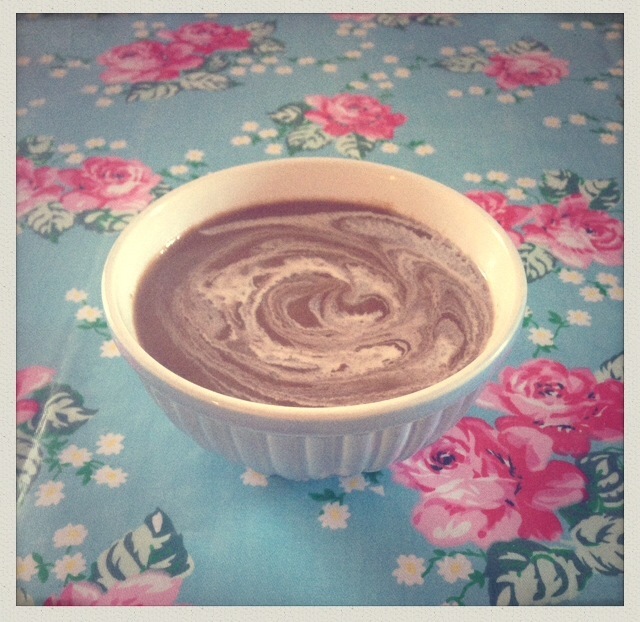 Allow to simmer for 10 mins, then blend and serve with a swirl of single cream. This delicious vegetable Brown Betty is a savoury twist on a classic dessert – perfect for a warming winter meal. 2. Heat the olive oil in a large saucepan and fry the onions until soft. 3. Add the garlic, peppers, aubergine and courgettes and stir to coat. 4. Add the tomatoes and tomato puree and allow to simmer for about 15 mins, until the sauce thickens. 5. Meanwhile, spread the breadcrumbs over a baking sheet and bake for 10 mins, until crispy and turning golden. Remove and reduce the oven to 160˚C. 6. Combine the melted butter with the grated parmesan cheese and stir in the breadcrumbs until evenly coated. 7. Spoon the vegetable mixture into an ovenproof dish and then cover with the coated breadcrumb. 8. Bake for 10 mins, or until the top is golden and serve with fresh basil leaves. There is a lot to be thankful for at this time of year; celebrate American Thanksgiving with this scrummy pie which makes the most of Autumnal flavours. 3. Whilst the pastry is cooking, put the pumpkin, sugar, butter, water, cinnamon, ginger and cloves in a deep pan and cook over a medium heat until the pumpkin is tender. 4. Blend and allow to cool. At this point, the mixture can be stored in the fridge for up to a week, or can be kept in the freezer. 5. When cool, add the egg and pour the mixture into the prepared pastry case. 6. Bake for 35-40 mins, until the filling is set. 7. Whilst the pie is in the oven, melt the butter and sugar together in a saucepan. Add the pecans and stir to coat. 8. 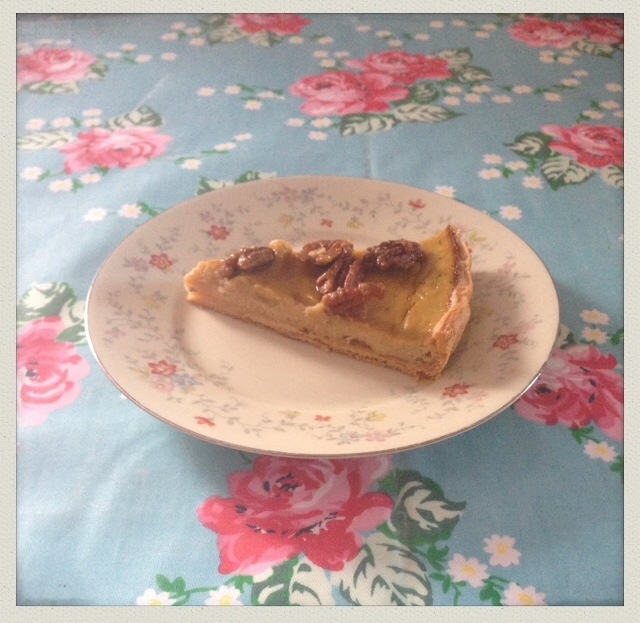 To serve, spread the caramelised pecans over the pie and serve with cream, ice-cream or by itself. 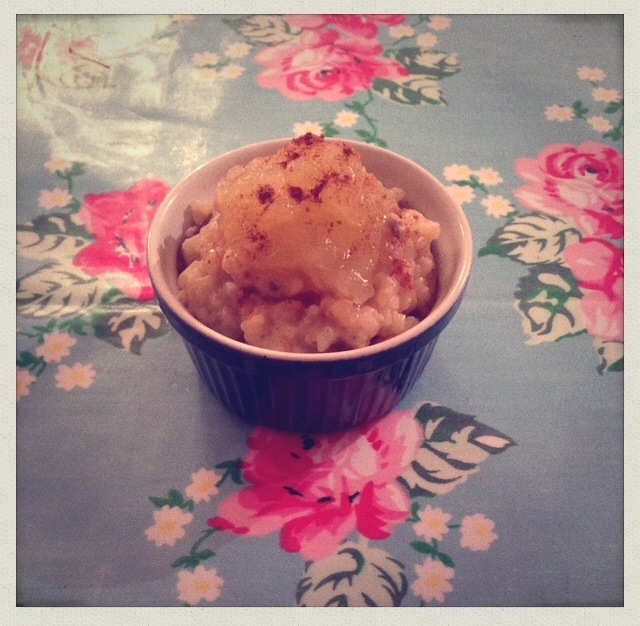 Rice Pudding is classic comfort food – perfect for these chilly winter evenings. This version is lightly spiced with cinnamon and cloves. Serves 2, or 4 as a small dessert. 1. Bring a pan of water to the boil and add the pudding rice. Cook for three mins, then drain and rinse with cold water. 2. Put the drained rice, milk, sugar, vanilla extract, cloves and cinnamon stick back into the pan and bring to the boil. Then reduce the heat and allow to simmer for 30 mins, stirring occasionally. 3. After 15 mins, add the sultanas to the rice mixture. 4. Whilst the rice cooks, add the apples, caster sugar and water to another pan and cook over a medium heat for about 20 mins, until the apples have collapsed. 5. When the rice is sticky and has absorbed most of the milk, turn off the heat and allow to cool slightly before serving with a dollop of the apple compote and a sprinkling of dried cinnamon. These biscuits with Wintery flavours of chocolate and spices are really simple to make, but are undeniably moreish – you won’t be able to eat just one! 2. Cream the butter and sugar together in a large bowl (melt in the microwave for 30 secs to make this easier). 3. Sift in the flour, baking powder, spices, chocolate, orange zest and juice and combine to form a dough (you might need to use your hands for this). 4. Tip out onto floured board and roll to 1cm thickness. Cut into 5cm circles and place on a lined or greased baking tray (they will expand slightly when cooking, so leave enough room between them). 5. Bake for 18-20 mins, or until golden. 6. Allow to cool for 5 mins on the baking trays and then transfer to a wire cooling rack to completely cool. This lovely lunch-time treat is inspired by Rachel Khoo’s Croque Madame Muffins (from ‘The Little Paris Kitchen’) and my favourite sandwich from the Bertinet Bakery, the Croque Champignon. We’ll call this the Croque Mademoiselle. Perfect for a late night snack, or a leisurely Sunday brunch. 2. Make the béchamel sauce first: melt the butter in a saucepan and then stir in the flour until it forms a paste. Slowly add in the milk and whisk to thicken (this should take a few mins). 3. Add the nutmeg, salt and pepper and allow to cool a bit before stirring in the cheese. 4. Roll the slices of bread out with a rolling pin until flat and then coat both sides with the melted butter. 5. 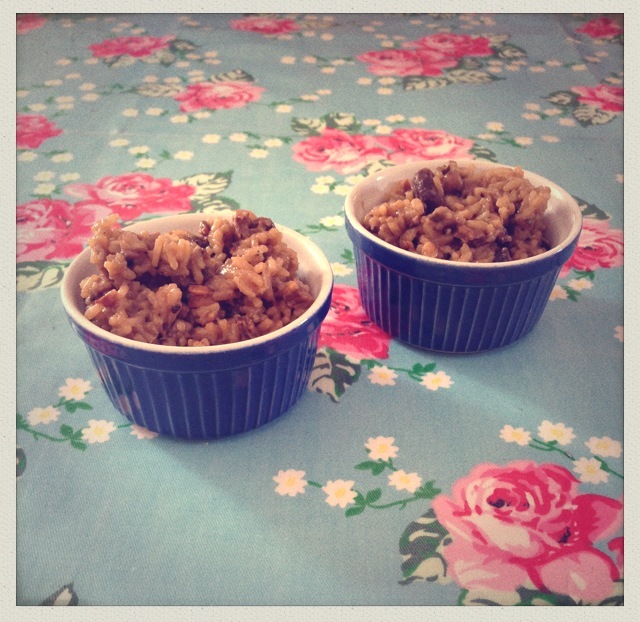 Press each slice of bread down into a ramekin, to form small ‘bowl’. 6. Add the sliced mushrooms to each ramekin, followed by an egg and a tablespoonful of béchamel sauce. 7. 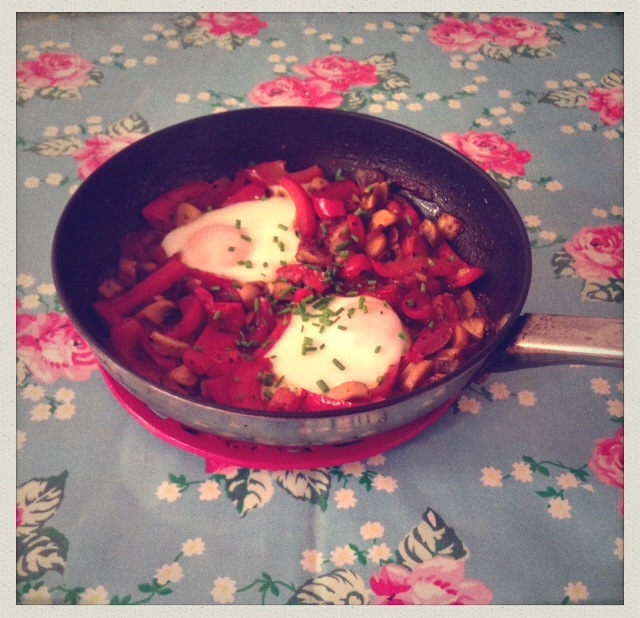 Bake for 15 mins, or 20 mins if you want a firmer egg. 8. 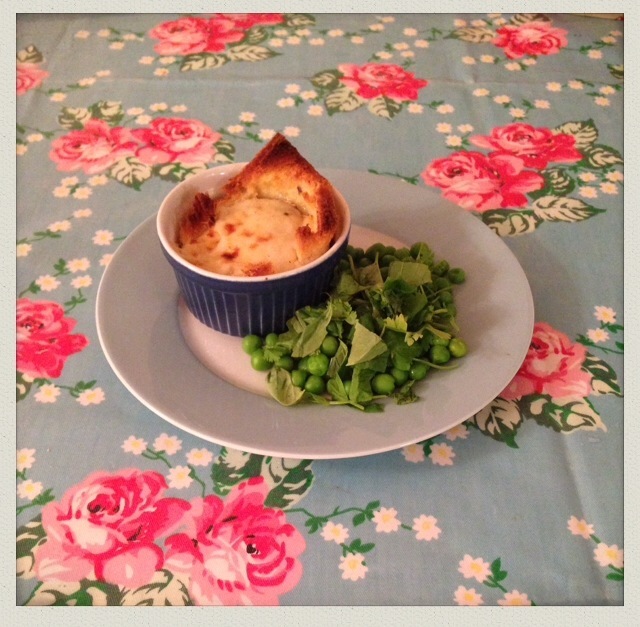 Serve with a simple green salad, such as peas and some fresh herbs – basil, mint or coriander. 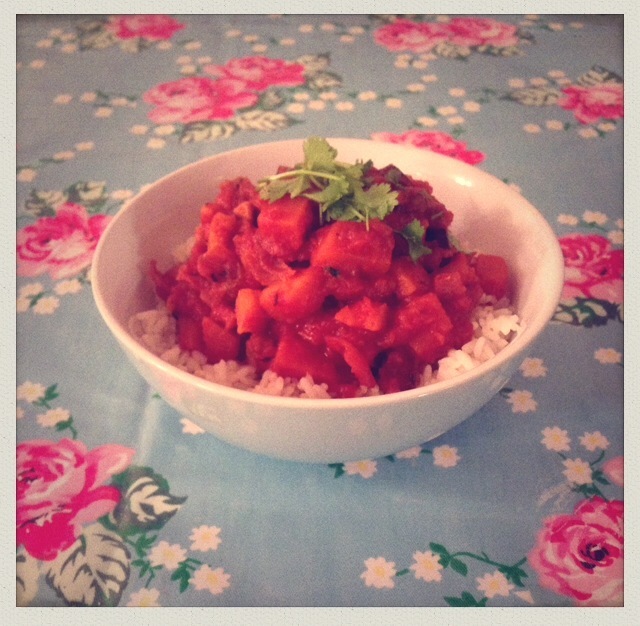 This lightly spiced Autumnal curry is deliciously warming on a miserable November evening. 1. Heat the olive oil and fry the cumin seeds and coriander seeds for 2-3 mins over a gentle heat, until beginning to brown. 2. Add the onion and fry for 3-4 mins until turning glossy. 3. Add the garlic, sweet potato and butternut squash and stir to coat. 4. Add the chopped tomatoes, tomato puree and water and allow to simmer for 15 mins until the sauce thickens. 4. Add the mushrooms and cook through for a further 5 mins. 5. Stir through with fresh coriander just before serving with rice. This cheesecake is deliciously indulgent and yet incredibly simple to make. Brilliant for a party or special occasion, or if you just need a treat! 2. Melt the butter and pour over the crumbled digestive biscuits. Stir to combine until it looks like wet sand. 3. Tip into a 20cm cake tin with a loose bottom and press down. Bake in the oven for 15 mins and then allow to cool. 4. Mix the cream cheese, double cream and vanilla extract together until smooth. Then stir in the icing sugar, golden syrup and 4 of the Crunchie bars (smashed into small pieces) and combine. 5. When the base is cool, tip the cream cheese mixture into the cake tin and smooth the surface. Leave to set in the fridge for 6 hours or overnight. 6. Sprinkle generously with the remaining 2 Crunchie bar pieces just before serving. 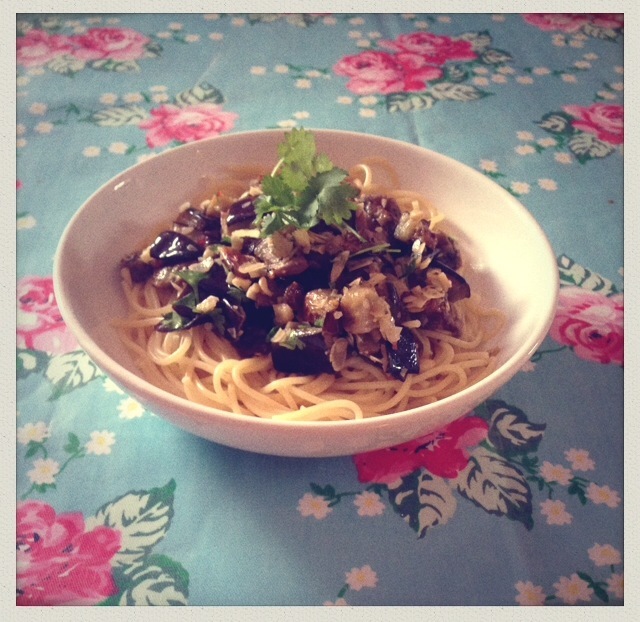 Make the most of the last of the aubergine crop with this deliciously spicy spaghetti dish with chili and coriander. 2. Heat the olive oil in a frying pan and fry the aubergine for about 10 mins, until soft. 3. Add the chili flakes, garlic and dried cumin and stir to coat. 4. Add the chopped almonds, sultanas, coriander, salt and pepper. 5. Drain the pasta and stir into the aubergine mix before serving. The weather has definitely taken a chilly turn this week, making boots and snuggly jumpers a must. 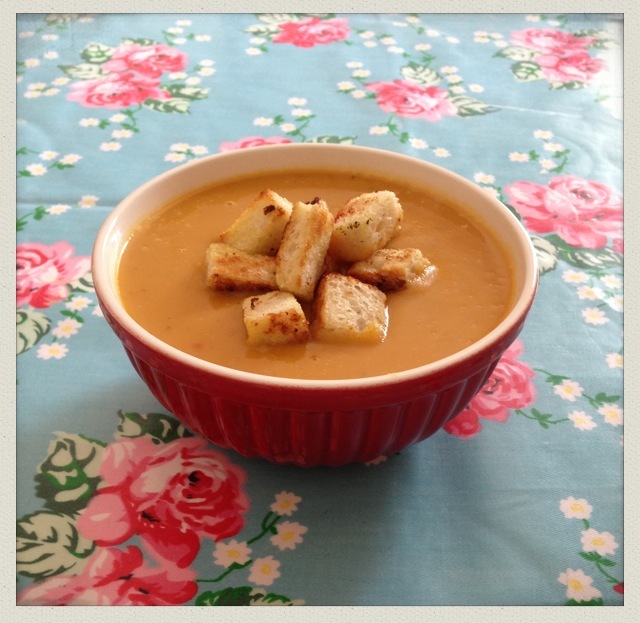 This deliciously creamy, sweetly spiced soup will warm you up from the inside. 1. Crush the cardamom pods in a pestle and mortar and remove the leaves. Dry fry in a pan for a minute or two over a low heat, to release the oils. Then grind in the pestle and mortar. 2. Heat 2 tbsp olive oil in a deep frying pan and fry the onions until soft. 3. Add the garlic, cardamom and chili flakes and fry for 2-3 mins until soft. 4. Add the butternut squash and sweet potato and stir for 5 mins, until evenly coated. 5. Add the vegetable stock, salt and pepper and allow to simmer for 20 mins, stirring occasionally to avoid sticking. 6. Whilst the soup is simmering, put the squares of bread and 2 tbsp olive oil in a plastic bag and shake to coat. Fry in a dry pan, stirring continuously until brown. 7. 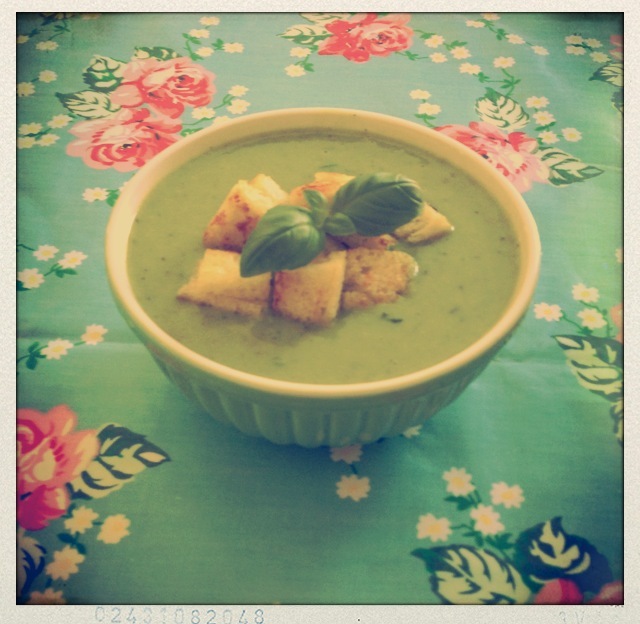 Blend the soup and serve with croutons. Salads are not just for Summer! This soba noodle salad is really healthy, with butternut squash, sweet potato and broccoli, and the addition of warming spices makes it a perfect, filling Autumnal lunch. 2. Put the sweet potato, butternut squash and garlic cloves in a roasting tin with the olive oil and roast for 30 mins. 3. Cook the soba noodles in salted boiling water according to packet instructions (usually 3-5 mins) and drain. 4. When roasted, peel the garlic, mash and stir through the sweet potato and butternut squash. 5. 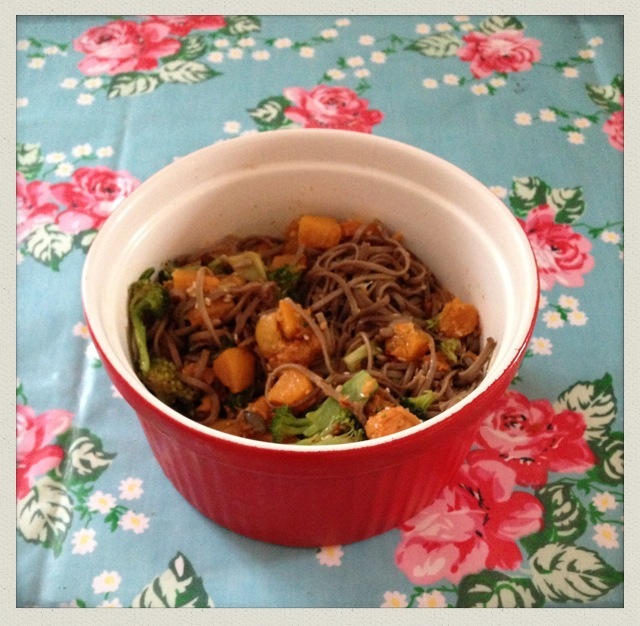 Combine the butternut squash and sweet potato in a bowl with the drained noodles and remaining ingredients and serve. This delicious take on a classic American dessert – the Brown Betty – uses seasonal plums and spices for a wonderfully warming Autumn pud. Serves 4 as a small dessert, or two as a hearty pudding! 2. Quarter and stone the plums and add to a large saucepan with the orange juice and zest, sugar, coves, cinnamon stick and star anise. 3. Bring to the boil and stir until the sugar dissolves. Then reduce and cover and leave for 10-15 mins until the plums have collapsed and you have a thick, sticky sauce. 4. Meanwhile, spread the breadcrumbs over a baking sheet and bake for 10 mins, until crispy and turning golden. Remove and reduce the oven to 160˚C. 5. Combine the melted butter with the ground cinnamon and sugar and stir in the breadcrumbs until evenly coated. 6. 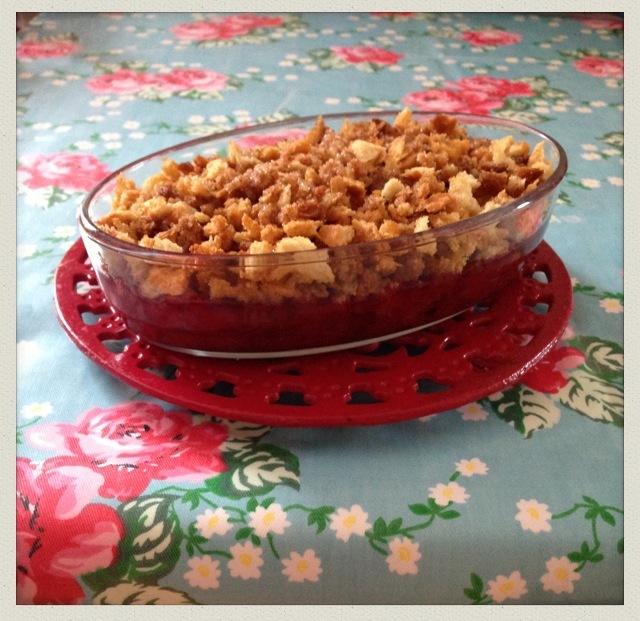 Spoon the plum mixture into an ovenproof dish and then cover with the coated breadcrumbs [traditional Brown Bettys layer up the fruit and crumbs, but I prefer the striking contrast of colour and flavour by just topping with breadcrumbs, so adapt to your tastes]. 7. Bake for 20 mins, or until the top is golden. This delicious curry is both really tasty and really healthy, as spinach are sweet potatoes are full of immune-boosting Vitamin C – essential at this time of year as the Autumn colds begin to set in. 1. Heat the olive oil in a deep frying pan and fry the onions until soft. 2. Add the garlic and curry paste and stir until evenly coated. 3. Add the potato, sweet potato, chopped tomatoes and tomato puree and allow to simmer until the sauce thickens. 5. Add the chickpeas and cook for a few minutes. 6. 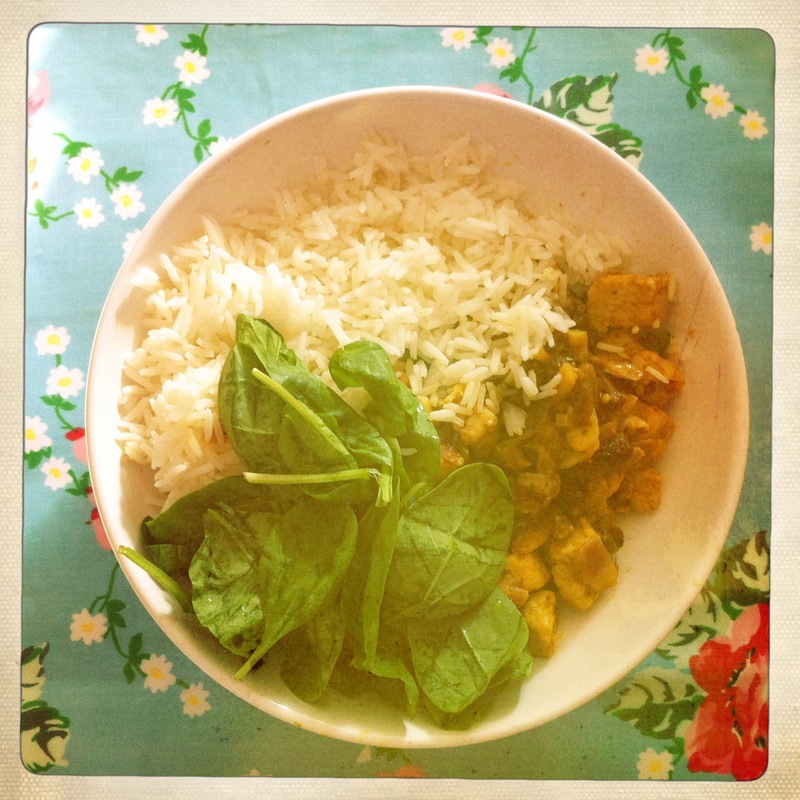 Add the spinach and stir through briefly before serving with pilau rice and a handful of spinach leaves. This Autumnal risotto has a deep, earthy flavour thanks to the mushrooms and roasted hazelnuts. Perfect for a starter at a dinner party or as a satisfying September supper. 1. Melt the butter in a large saucepan and when foaming, add the garlic and onion and fry gently until soft. 2. Add the rice and stir to coat for 5 mins. 3. Add the whisky and stir until evaporated. 4. Then slowly add the stock, 100ml at a time and stir until absorbed. 5. After adding 500ml of stock, add the mushrooms and continue to stir. 6. When all of the stock is absorbed (after about 20 mins of stirring), add the soy sauce, roasted hazelnuts, salt and pepper and stir through before serving. When I was little, I used to love afternoons spent shelling peas with my Granny. There is something beautifully simple and satisfying about breaking open the pods to see all of the tiny peas lined up neatly. You can use frozen peas in this recipe, but why not make the most of the last of the harvest with this deliciously deep soup. 1. Heat the olive oil in a large saucepan and gently fry the garlic for 5 mins until beginning to soften. 2. Add the vegetable stock and peas and cook for another 5 mins. 3. Add the pesto, basil leaves, salt and pepper and blend until smooth. 4. 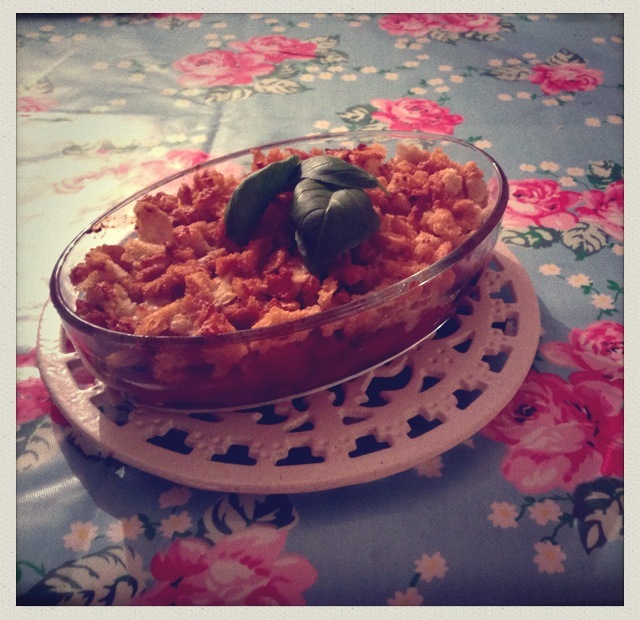 Serve with garlic croutons and fresh basil leaves. 1. Combine all ingredients in a plastic sandwich bag and shake vigorously to evenly coat the bread. 2. Heat a large frying pan and empty the bag, stirring until the croutons turn golden brown. 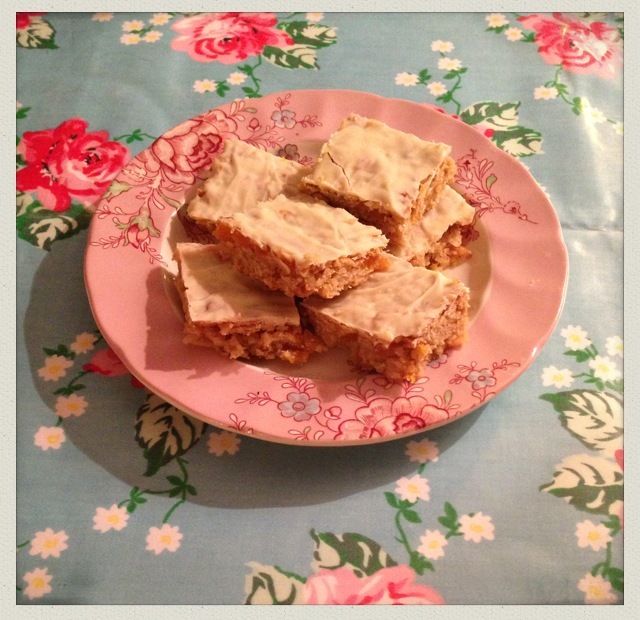 Flapjacks are one of my favourite things to bake – they are so simple and you can add pretty much anything to them. Plus, the mixture is great straight from the bowl! These summery flapjacks make the most of the light and delicate flavours of apricots, almonds and white chocolate. 1. Preheat the oven to 180˚C and line a deep baking tray with greaseproof paper. 2. Gently melt the butter and golden syrup together over a low heat. 3. Add in the vanilla extract and stir in the porridge oats, apricots and almonds until evenly coated. 4. Tip into the baking tray and press down evenly. 5. Bake for 15-20 mins, until golden brown on top. 6. Allow to cool on a wire rack and, whilst cooling, melt the white chocolate in a bowl over a pan of boiling water. 7. Drizzle or pipe the melted chocolate over the flapjacks and spread with a palette knife. 8. 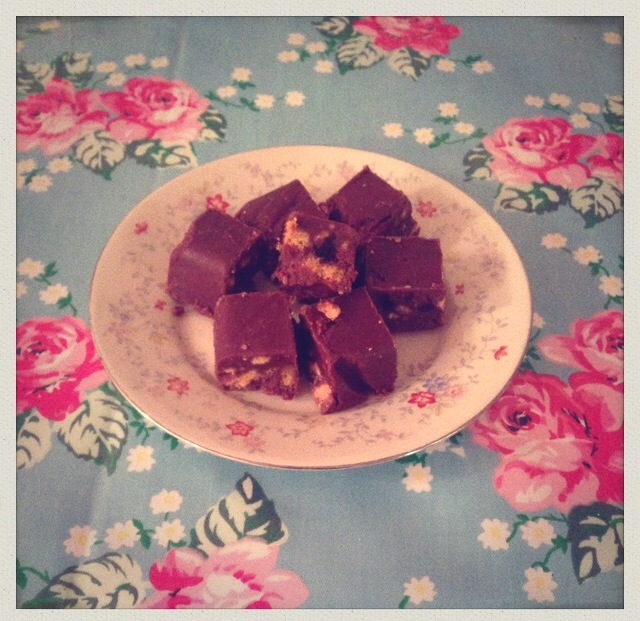 When cool and the chocolate has set, cut into squares. This really easy dessert is not only delicious but can literally be whipped up in just a few minutes. What’s more, all of the ingredients are things you probably already have in the fridge, freezer or cupboard – and if you don’t, this is a great excuse to always have them in stock! 1. 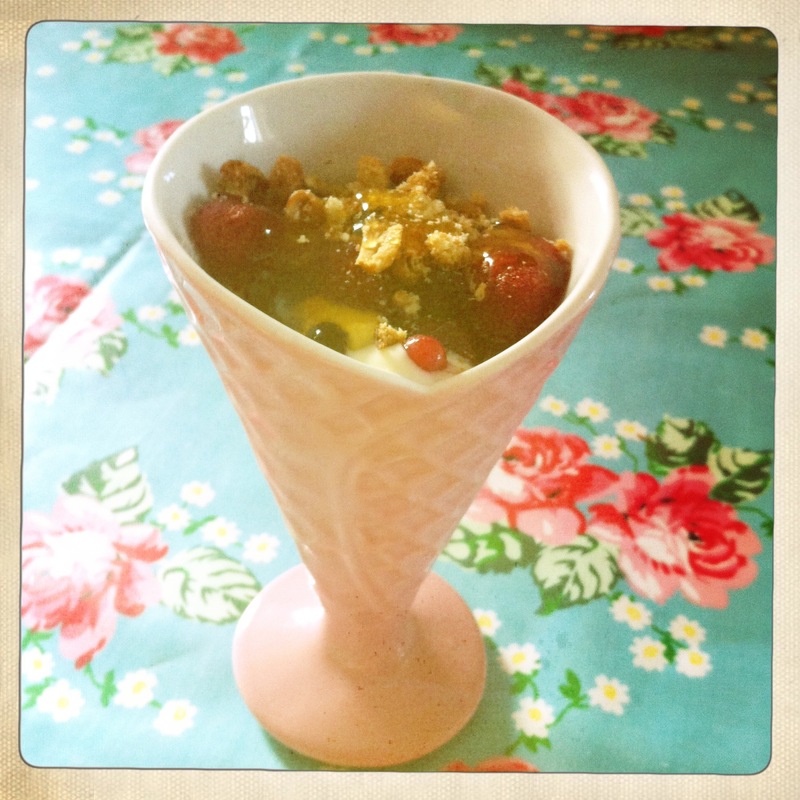 Simply layer up the berries, whipped cream and crumbled biscuits in pretty bowls or ice cream dishes (I try and do at least two layers of each for a range of colours, textures and flavours) and drizzle with honey – it’s that simple! 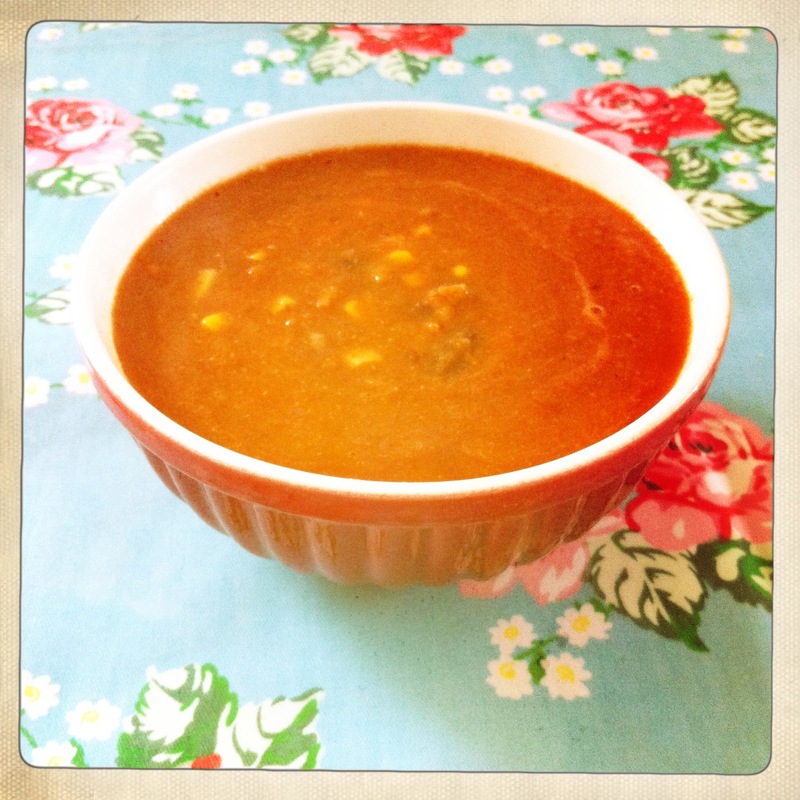 With the weather feeling more like Autumn than August this week, warm up with this deliciously spicy sweetcorn soup. It takes just a few minutes to make and most of the ingredients are things that you probably have in the store-cupboard already. 2. Add the garlic, chili, cumin, paprika and cinnamon and stir to coat. 3. Add the chopped tomatoes, vegetable stock, tomato puree, sweetcorn and red kidney beans and allow to simmer for 5 mins. 4. Blend half of the soup (or all if you prefer a smooth texture) and serve immediately. 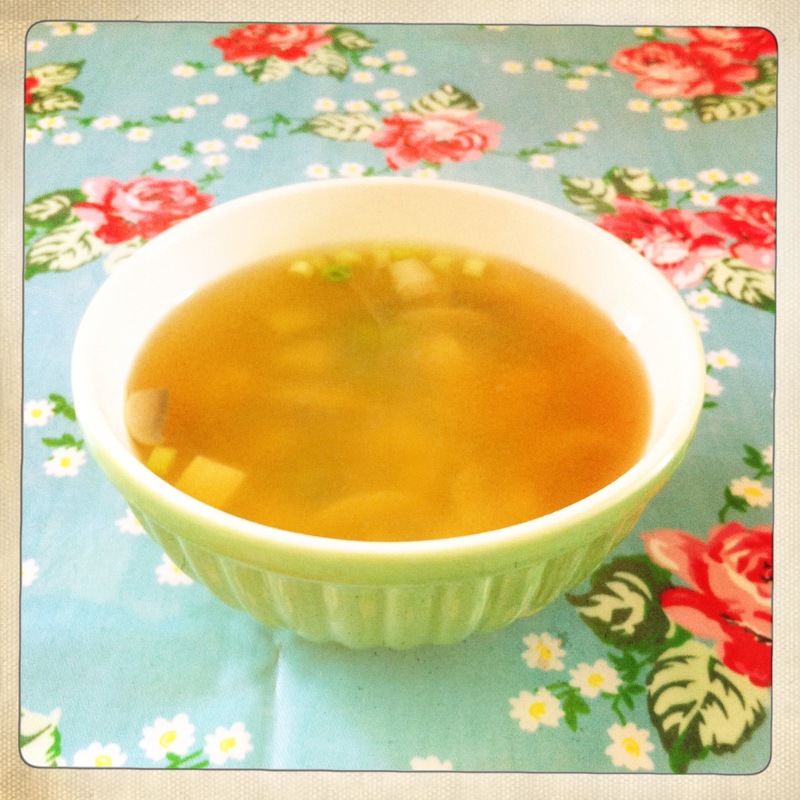 This super simple soup makes a lovely refreshing Summer lunch. It’s really healthy too! 1. Gently heat the miso paste, chili paste and stock together in a large saucepan. 2. Add the tofu, spring onions, mushrooms and frozen peas and cook through for 3-4 mins. 3. Remove from the heat and drizzle with soy sauce and sesame oil before serving. This deliciously creamy and lightly spiced korma is really quick to make and much healthier than a microwave meal. I’ve used Quorn pieces, but you could easily use chicken instead. 3. Add the Quorn pieces, coconut milk, nutmeg and cloves and allow to simmer until thick. 4. While the curry is simmering, dry fry the flaked almonds (heat in a frying pan with no oil and stir until golden brown). 5. 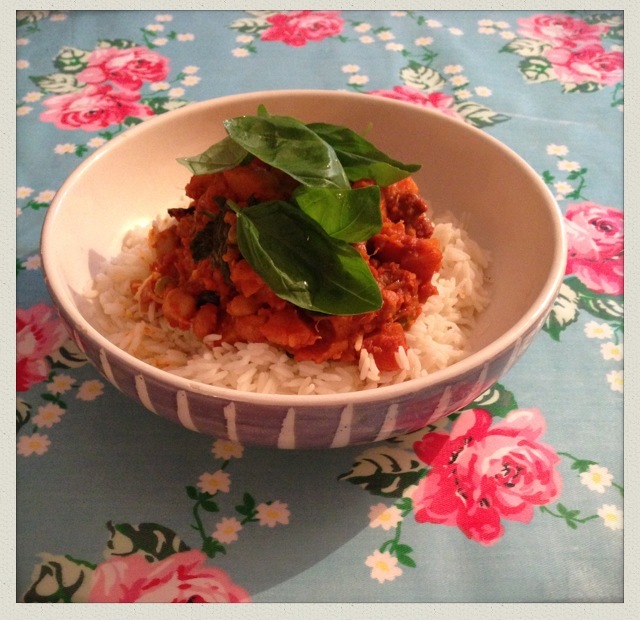 Stir in the sultanas and flaked almonds and serve with pilau rice and green salad.